Spanish Chicken & Rice | sweet ravioli! This dish is another comfy, homey dish that makes you feel good! I found the recipe in a magazine and have made it several times. I was so happy when I made it the other day because my 20 month old loved it! As a mum you LOVE a dish that your children love. Little man loved shovelling the rice into his mouth with his little spoon. My Spanish chicken and rice doesn’t pretend to be an authentic paella – there is no paella pan required, no saffron and no seafood. Just good old chicken and chorizo. What I love about this dish is the chorizo – have you noticed how much juicy goodness seeps out of a chorizo sausage when you cook it? You hardly need to add any extra spices to this dish because the chorizo sausage has it all. Heat some oil in a large, deep saucepan over moderate heat. Cook chicken and chorizo, stirring, for 5-7 minutes or until chicken is cooked and chorizo is crisp. Transfer to a plate. Keep those yummy juices in the bottom to cook your onion (add a little more oil if needed) until soft. Add spices: stir until fragrant. Stir in rice and capsicum. Add stock and 1/2 cup water. Bring to the boil and then reduce heat to low and cover tightly. Simmer for 12-14 minutes or until liquid is absorbed and rice is tender. Try not to take the lid off the saucepan until at least the 10 minute mark. 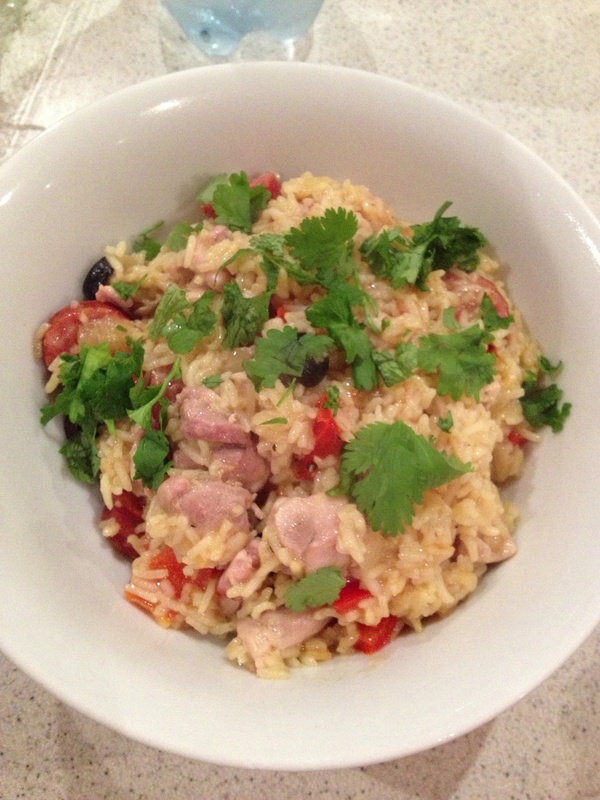 Add lemon juice, coriander, olives and your cooked chicken and chorizo, stirring until heated through. Serve immediately. TIP: If you don’t have all the spices, use Porguguese seasoning – just as good! This sounds like a great recipe. Ive never eaten chorizo sausage so interested to taste it. A quick meal I can make during the witching hour with Ava on my heels. This looks terrific and reminds me of paella. Yum. I should attempt this one. Never had chorizo Gen, really? It is quite spicy but very yummy. Much like a good Italian sausage.